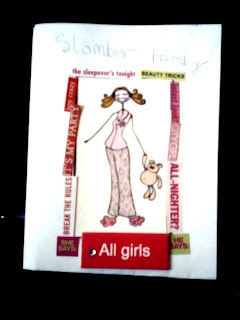 Every thing on the card was used from Michell's goodies box!The all girls sticker my sister got me when we went to see Wall-e!Good movie!Anyways the image was on some card that was in the box!I riped it off LOL!! Then the stickers around the image was in the box too!W/ quotes n stuff! Carrie Ann and I r bffls.We got eachothers back.My sister Chrissy and I tlk to Carrie Ann online n stuff!We hang out alot so since she lives up tha road,i ask sum stuff to see wut she likes!So my sister made her a carebear card! (Carries IM name is carriecarebear! 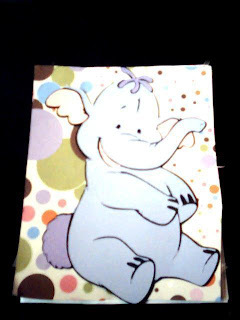 )So i thought y make another care bear card?So i made her a heffalomp(if thats how u spell it) card!She likes those too! I used the heffalom that my sis made! And sum paper not sure tha name but got it from my sister! On the Last day of skool(6/26/08) my daddy made a BIG fire!So we took some pics!Yup!It's big!! I got a BIG box of scrapbooking stuff,for my b-day(7/6/).I shared sum of it w/ my sister!